Dan Biggar slotted a long-range penalty in the 73rd minute to hand Wales a dramatic win over England in an incredible World Cup match at Twickenham. England had dominated the first half, Jonny May crossing, but their ill-discipline in the second period allowed Wales to erode their lead. Then Gareth Davies crossed for a try that levelled the scores before Biggar put them in front. England had a penalty of their own in the last few minutes but opted for the corner and could not cross the whitewash. Simply an epic match. Intensity – From the noise of the crowd, the passion of the players and the physicality of the contest, this was a match to give you goosebumps. Emotions boiled over on occasion, Dan Biggar and Mike Brown among those to vent their feelings whilst also showing their class, but there was never any doubt as to how much was at stake during this match. Let’s hope for more of the same throughout this World Cup. 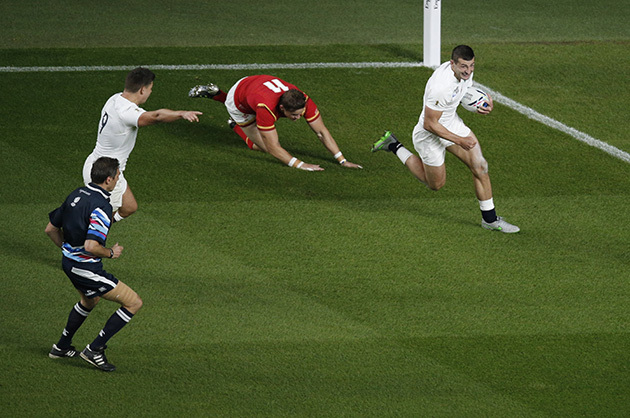 Fancy feet – Round of applause to Mike Brown for controlling the ball with his feet in the build-up to Jonny May’s try. Not sure his beloved Manchester United will be on the phone offering him a contract, but if he’d tried to pick up the ball he would most likely have knocked on and the chance would have disappeared. And Lloyd Williams deserves mention too. Playing out of position on the wing, he put through a lovely kick for Gareth Davies to score under the posts. Dan Biggar and Owen Farrell were both immaculate from the tee too. Jerome Garces – The French referee impressed with his officiating of South Africa v Japan last weekend and took a similar approach here. He lets the game flow and allows teams to build momentum, only blowing when necessarily. He’s firm in his calls but there’s little of the stop-start nature we’ve seen in many games so far at RWC 2015. This comment to Sam Warburton also raised a smile: “Two and ten (Scott Baldwin and Dan Biggar) talk too much”! Injuries – Could it get any worse for Wales? Even before the tournament started they had Jonathan Davies, Leigh Halfpenny and Rhys Webb ruled out, and now they can’t seem to go through a game without picking up more injuries – the Williamses Scott and Liam both leaving the field on a stretcher here, and Halam Amos hurting his arm. Pre-match build-up – These so-called insightful interviews held inside the stadiums before kick-off by presenters whose rugby knowledge is patently lacking can get on the nerves. There’s no need to force an atmosphere at a game of this magnitude – the capacity crowd are perfectly capable of generating that on their own. Wales’ set-piece – The Welsh scrum was under pressure from the off and they conceded three penalties from that facet of play early on, meaning they conceded either territory or points. 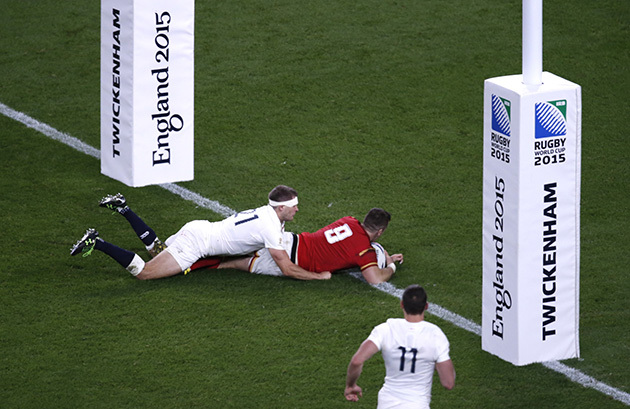 The lineout was flaky too, whether the officials ruled it not straight or England stole it. Overall, the set-piece combined to put pressure on Wales and will need to improve as they move through the tournament. 32 – The number of missed tackles in the match, 17 by England and 15 by Wales. 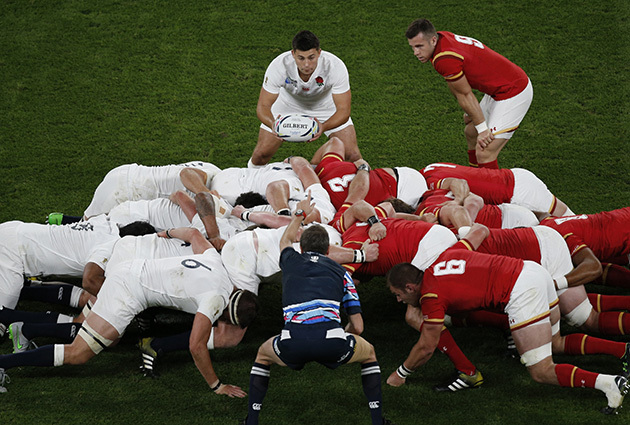 23 – The number of penalties in the match, 12 conceded by England and 11 by Wales, including four at the scrum. 84 – The number of metres made by Billy Vunipola, more than any other player. England: M Brown; A Watson, B Barritt, S Burgess (G Ford 70), J May; O Farrell, B Youngs (R Wigglesworth 49); J Marler (M Vunipola 61), T Youngs (R Webber 67), D Cole (K Brookes 72), G Parling, C Lawes (J Launchbury ht), T Wood, C Robshaw (capt), B Vunipola (J Haskell 63). Try: May. Con: Farrell. Pens: Farrell 4. DG: Farrell. Wales: Liam Williams (R Priestland 67); G North, S Williams (A Cuthbert 63), J Roberts, H Amos (Lloyd Williams 67); D Biggar, G Davies; G Jenkins, S Baldwin (K Owens 49), T Francis (S Lee 49), B Davies (L Charteris 70), AW Jones, D Lydiate (J Tipuric 70), S Warburton (capt), T Faletau. Try: G Davies. Con: Biggar. Pens: Biggar 7.